Love them or hate them, reality shows are an ubiquitous part of the cultural landscape. The most popular examples, and the most problematic, tend to bring viewers into the lives and homes of families who capitalize on their secrets or supposed singularity. 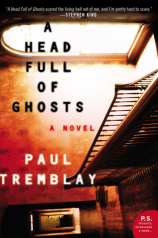 Like the reality shows it critiques, Paul Tremblay's A HEAD FULL OF GHOSTS is fascinating and heartbreaking as it portrays a family that chooses to broadcast itself at its worst. When 14-year-old Marjorie Barrett begins to exhibit signs of mental illness, her family first turns to doctors and medications. But when she doesn't stabilize quickly and continues to act in confusing and frightening ways, her father's latent Roman Catholicism becomes his source of strength. John Barrett shares his concerns for his daughter with his priest, Father Wanderly, and is soon skipping Marjorie's doctor appointments for time at church. John and Father Wanderly come to believe that Marjorie is possessed by a demon. 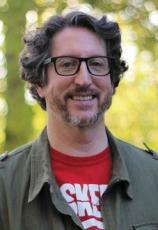 "Creepy, dark and often quite sad, Tremblay's latest is unique and unpredictable. The information readers have, in the end, proves unreliable, making A HEAD FULL OF GHOSTS haunting in a psychological, postmodern way." Somehow they come into contact with a production company that wants the Barretts to star in a reality show and air the exorcism the priest plans to conduct. Marjorie's mother, Sarah, is skeptical, to say the least, but is swept up in the chaos and finds herself a just barely willing participant in the TV project and in the exorcism. The fourth member of the family is eight-year-old Merry. Often the object of Marjorie's frightening tales and threats of violence, but a fierce defender of her big sister, Merry is caught between the love she feels for Marjorie and terror, not to mention the pandemonium of the show. The narrative moves between two related points of view. The first is of Merry 15 years after the show “The Possession”aired and all the subsequent events that affected her family. She has been contacted by the writer Rachel Neville, who hopes to write a book on the Barretts, the program and everything that happened. Rachel finds Merry to be a lonely young woman with a possible unhealthy interest in horror films and stories. Merry seems quite willing to share her memories of her sister and parents during the time of Marjorie's illness. The bulk of the novel is Merry sharing with Rachel those reminiscences and letting her story unfold. The second perspective is that of Karen Brissette, who, in a series of smart and scathing blog posts, attempts to deconstruct “The Possession” and place it in the realm of both reality television and American horror. Merry's description of her family and the events that took place when she was eight are harrowing, to say the least. It was unclear to young Merry (and so remains unclear still) how much of Marjorie's actions were beyond her control and what she did in order to scare her family. It is clear in either case that she was quite intelligent and also disturbed. Karen's blog gives a more objective view of the family, but only what could be known from the show, which was clearly manufactured and edited. Astonishingly referential, A HEAD FULL OF GHOSTS is a commentary on the phenomenon of reality television where reality has been scripted and also an ode to the horror genre. But, more than that, it is an exploration of the human condition, mental health, truth and perspective, and even religion, gender and exploitation. Creepy, dark and often quite sad, Tremblay's latest is unique and unpredictable. The information readers have, in the end, proves unreliable, making A HEAD FULL OF GHOSTS haunting in a psychological, postmodern way. There is much to piece together and try to understand after the novel ends and much to enjoy while reading it.